ShenZhen OCEANPOWER Food Technology Co., Ltd.
ShenZhen OCEANPOWER Food Technology Co., Ltd. is a subsidiary company of Shenzhen OCEANPOWER Industry Co., Ltd., founded in 1996; we mainly deal in soft ice cream machines, ice cream powder, and other healthy foods. 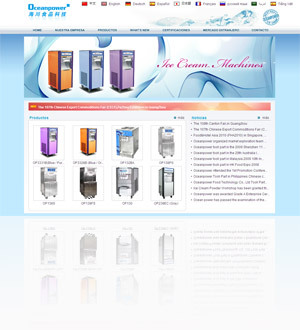 OCEANPOWER soft ice cream machines and its management have been proven time after time to be one of the most reliable machines manufacturers in China. This is why our machines have successfully entered the market from all over the world. Since 1996, our company has manufactured soft ice cream machines using advanced technologies that cater for satisfying the safety, health, and environmental requirements. Therefore only approved materials for food machinery have been used in order to ensure the safety of the final product, including SUS304 stainless steel, ABS and POM plastic consumable parts and silicon rubber packing and gaskets. After decades of development, more than 70 branch offices have been established at home and abroad. For future development, we are mainly devoting energy to R&D, and cooperating with some famous universities and institutions. As of right now we have got more than 20 national patents, and been authorized by the Standardization Administration of China to set the national standards for soft ice cream machines and powder in 2005. In China, We are the BIGGEST professional manufacturer for soft ice cream machines and ice cream powder. We have acquired CE, CB , NSF, LET, UL, RoHS, GOST and GS certification. Our company and it’s production line is following HACCP, ISO14001 environment certification, and ISO9001 quality certification from SGS. Our products have successfully entered the market of Southeast Asia, Middle East, South America, Europe, Oceania and Africa. Insisting on the principle of "Quality, Service, Reputation", OCEANPOWER will keep continuing to face challenges and difficulties head on, to create a better tomorrow.